Pwllheli TownPwllheli is the main town on the Llyn Peninsula and has many varied shops in its High Street and an open-air market on the Maes each Wednesday. Pwllheli has a strong maritime tradition - the new marina and harbour development has over 400 berths, and the sailing club hosts World, European and National championship races. The town has a leisure centre, a golf club, a cinema, and exhibitions are shown at Oriel Penlan. This part of Wales is a stronghold of the Welsh language, and it is the first language of the vast majority of the local population. Just outside Pwllheli at Chwilog is Talhenbont Hall, built in 1607. It has had something of a chequered history, once used as a garrison for Cromwell's soldiers, and now has its fair share of friendly ghosts! The estate is not only a designated natural habitat for otters, but also houses the national clematis collection. 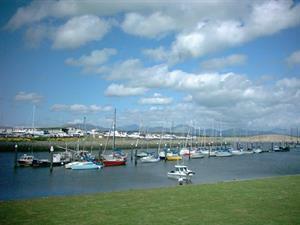 Pwllheli is the main town on the Llyn Peninsula and has many varied shops in its High Street and an open-air market on the Maes each Wednesday. Pwllheli has a strong maritime tradition - the new marina and harbour development has over 400 berths, and the sailing club hosts World, European and National championship races. The town has a leisure centre, a golf club, a cinema, and exhibitions are shown at Oriel Penlan.